Cast: Cheryl Yang, Ming Dao, Chris Wu and Wang Si Ping. Zhong Wu Yan (Cheryl Yang) has been judged by her appearance her entire life due to a birthmark on her face. As a child she met a boy Qi Xuan, who tells her that her birthmark is beautiful, which starts a ‘years long crush’. 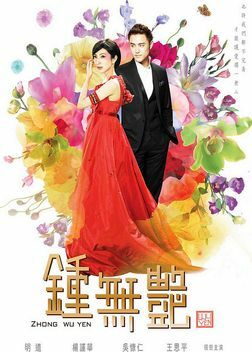 Several years later, Qi Xuan (Ming Dao) who has become a ‘full grown brat‘ who judges people by appearance (the hotter the better), tries to woo ‘the sexiest woman’ Xia Ying Chun (Wang Si Ping), only to be fooled and left naked in the middle of nowhere, there he meets Wu Yan again, but doesn’t even recall her, whereas Wu Yan still is head over heels. After a lot of incidents, it turns out that Wu Yan’s and Qi Xuan’s fathers are friends, and they had made a promise for their children to marry. Both refuse, but due to Qi Xuan’s fathers illness, Wu Yan agrees to move in with them, and help Qi Xuan with his work. As the two of them become closer, another character arises, Howard (Chris Wu) who has a secret and strong interest in Wu Yan. Okay, describe in one word: hmm, cliché’ish? But then again, not really. It is with the typical ceo vs. tom girl, but I feel they really did something with the characters, they are pretty.. How do I say this? Human? They really aren’t those stereotypes; okay yeah Qi Xuan is snob, but on the other hand childish. Wu Yan is a tom boy, but not really stubborn. Howard is mr. Perfect, but not controlling, and Ying Chun is the obsessed ex, but doesn’t play dirty (all the time). Cast is great, love Ming Dao and he is the main reason for me to watch this.